There's a bittersweet taste in the air as legendary chef Armando Percuoco steps down from his beloved restaurant Buon Ricordo to hand over the reins to his protégé chef David Wright. So what is the new Buon Ricordo going to be like and the question that everyone wants to know: will the fettucine al tartufovo still be on the menu? 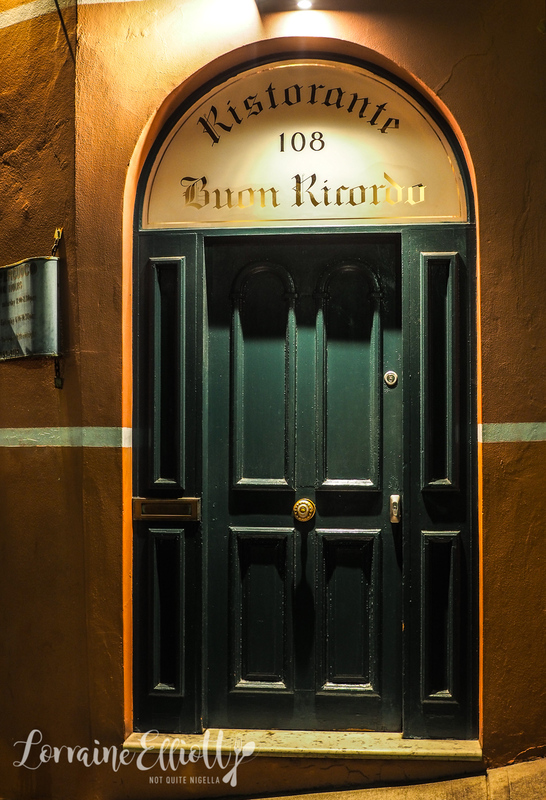 "In 1987 we opened this restaurant and my wife Gemma and I have been here since. We try to not be trendy," says Armando of the restaurant where tablecloths are ironed and white jacketed waiters attend to patrons. Armando is stepping back to retire but this really means that he will focus on his other hospitality baby, Valleyfield Escapes in the Hunter Valley. His successor chef David wright originally from the Central Coast in NSW has been in the Buon Ricordo kitchen since he was a teen after winning a one week stint to work in the kitchen and has been the Head Chef for the past 7 years. The other guests at this handover dinner include his chef best friends-Tetsuya Wakuda stands up and makes a heartfelt speech. They have calculated that he has eaten here around 2,000 times. He tells us that learnt the business side from Armando. Janni Kyritsis also makes a short speech. 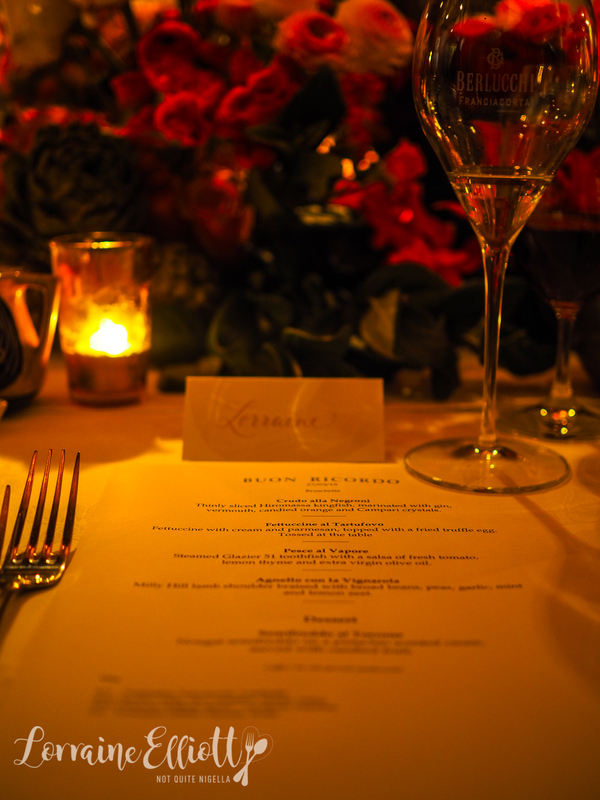 The first course of David's new menu is his creation. It's thinly sliced Hiromasa kingfish that has been marinated with gin and vermouth with candied oranges and Campari crystals. 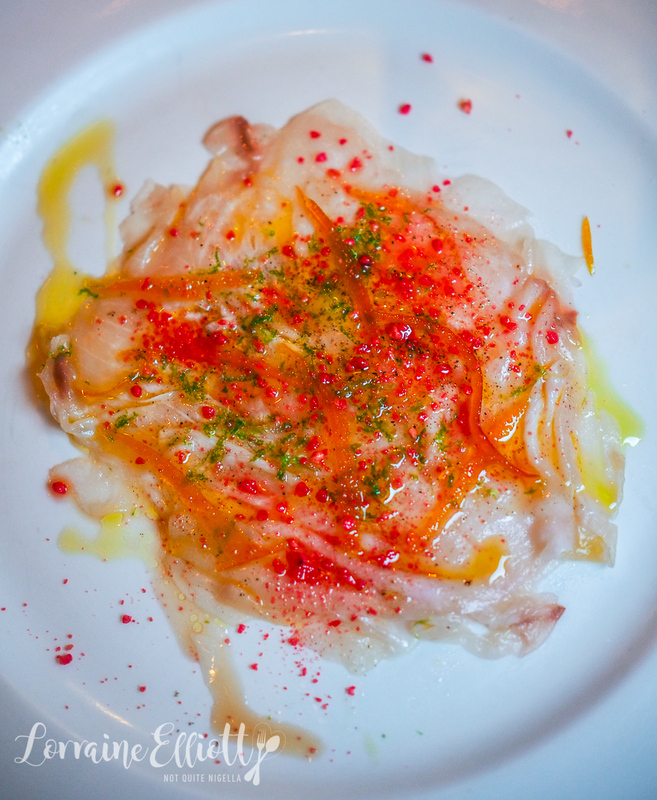 The fish melts in the mouth but is given additional texture from the bitter, crunchy Campari crystals. And his famous truffle egg fettucine? If you haven't eaten it Dear Reader it's a dish made with fettucine with cream topped with a fried truffle infused eggs and freshly grated parmesan. It's also what 65 out of 70 guests order every night and appears on many a food bucket list. 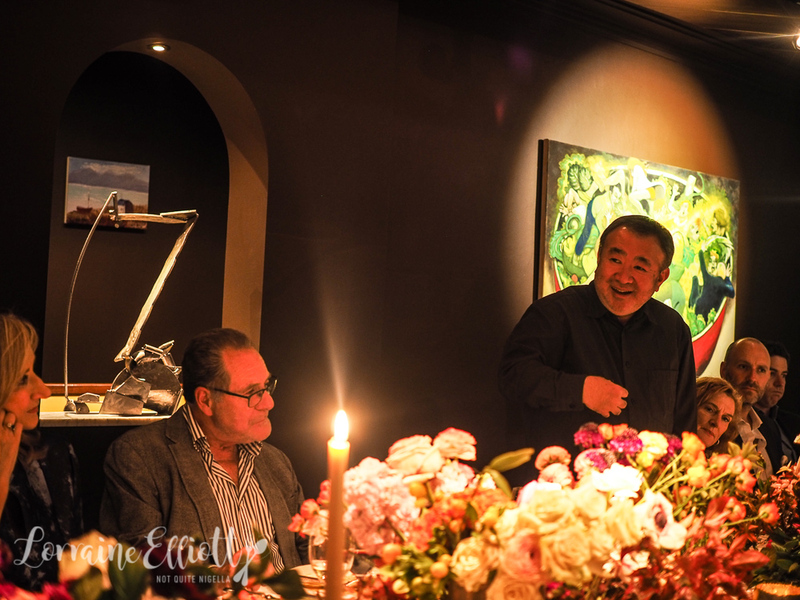 Armando tells the story of how his most famous dish came to be. "Around 25-30 years ago I got a phone all from Melbourne. A man said 'I have a product from Italy it's called truffle eggs'. Straight away I said I have truffle infused of everything, leave me alone," he says. 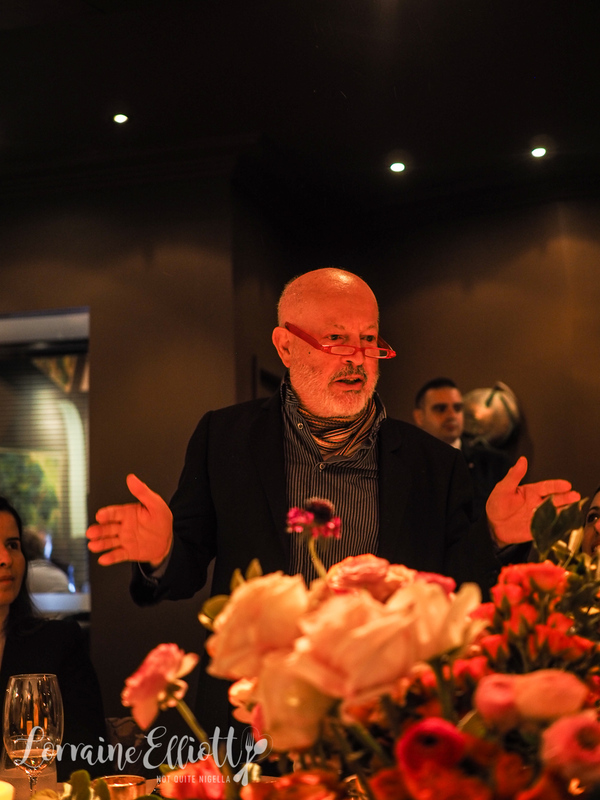 But the gentleman persisted and Armando agreed to try the eggs and before long he received over a dozen truffle eggs. He first thought of asparagus with truffle eggs and parmesan cheese. 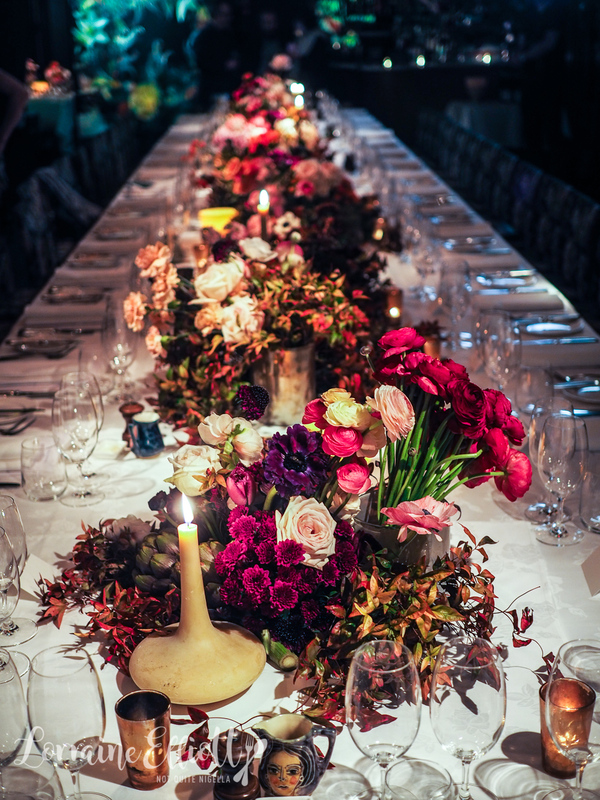 But he always tested new dishes with staff at the end of a service and they decide their fate but it was Gemma who encouraged him to put it on the menu. We were all wondering if this dish would change or been given a modern spin. 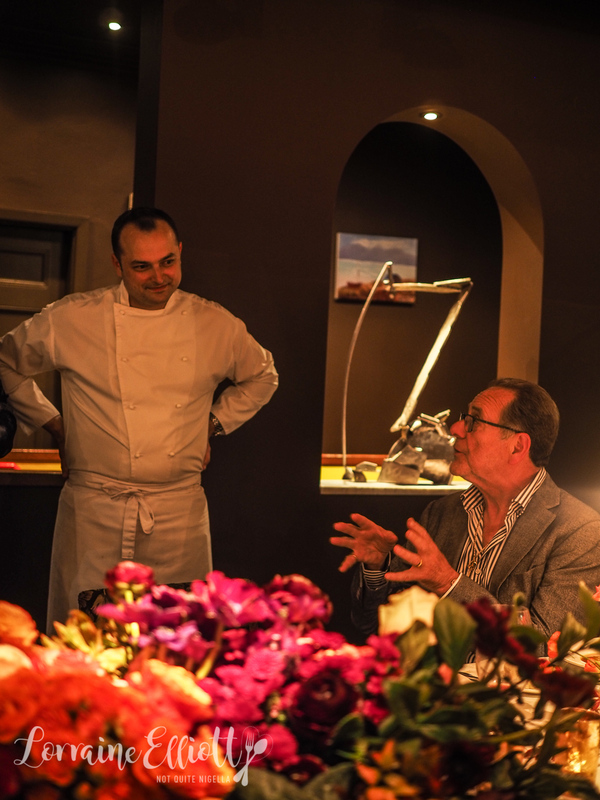 After all to take on such another chef's legacy is daunting, possibly even burdensome. But this remains the same - silky pasta bathed in cream and butter, soft egg white and runny yolk, the aroma of truffles perfuming the air before this dish appears. It is mixed up and portioned perfectly by the wait staff. I've saved room for this course and I eat it rhythmically twirling on my fork with a spoon, slowly, langorously, sad when it ends but satisfied. This is a dish best shared because it is so rich. 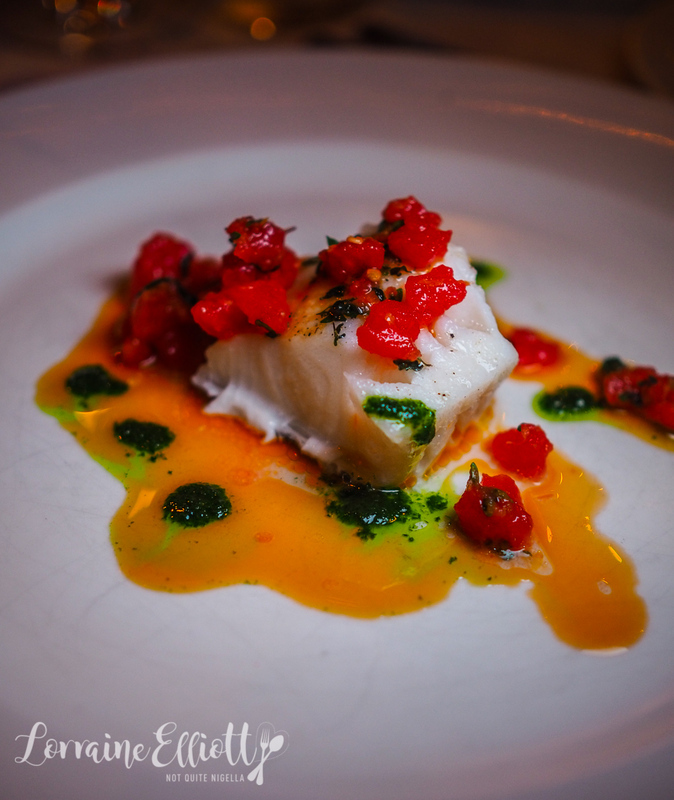 The fish course is a fat fillet of steamed Glacier 51 toothfish with a salsa made with fresh tomato, lemon thyme and extra virgin olive oil. The fillet is luscious and I love the fresh tomato salsa and olive oil. So much so that, although we have five courses tonight, I reach for some bread and mop up the juices on the plate fare la scarpetta style and then reach over and do the same to Mr NQN's plate. 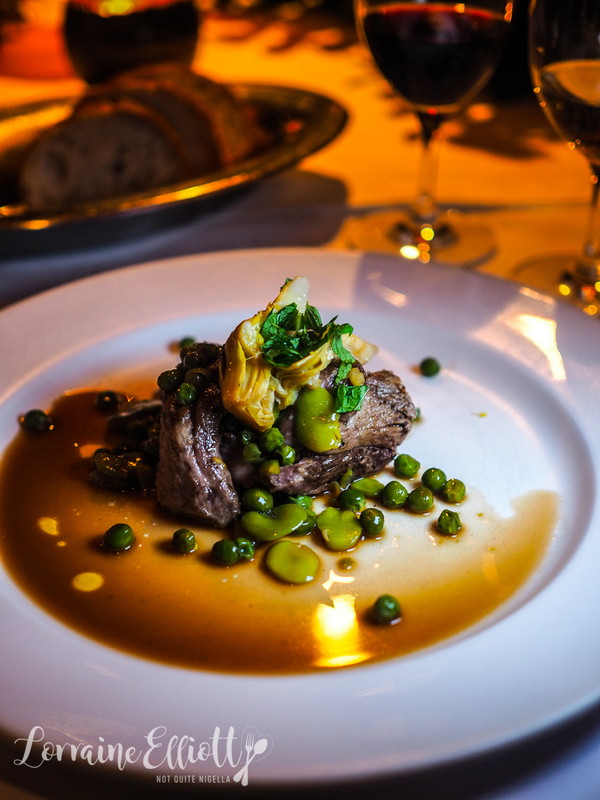 The last savoury course is a rich, slow cooked Milly Hill lamb shoulder that is fall apart soft and served with broad beans, peas, garlic, mint and lemon zest to lighten the rich, soft meat. The semifreddo al Torrone is a sweet ending to a night punctuated by heartfelt well wishes, double cheeked kisses and the promise of good stories to come. 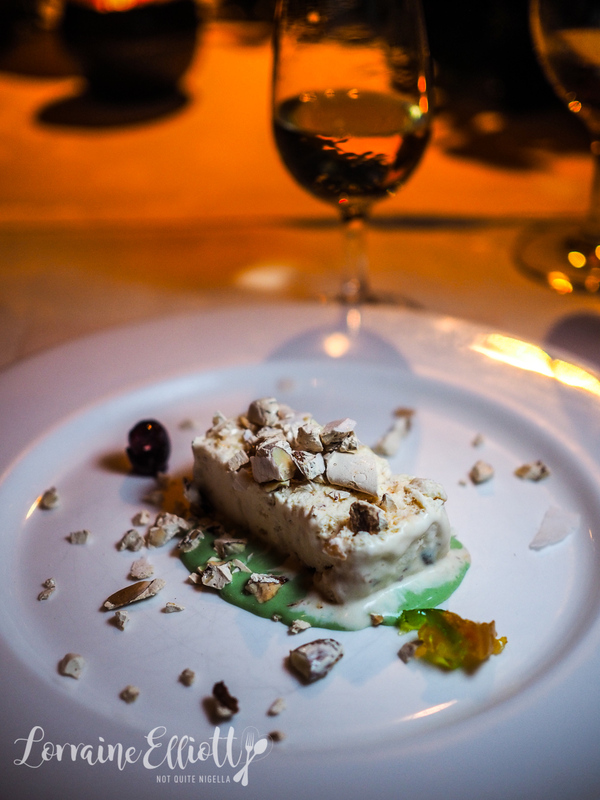 The nougat flecked semifreddo is served with a pistachio scented cream, candied fruit and rubbly crunchy nougat on top. 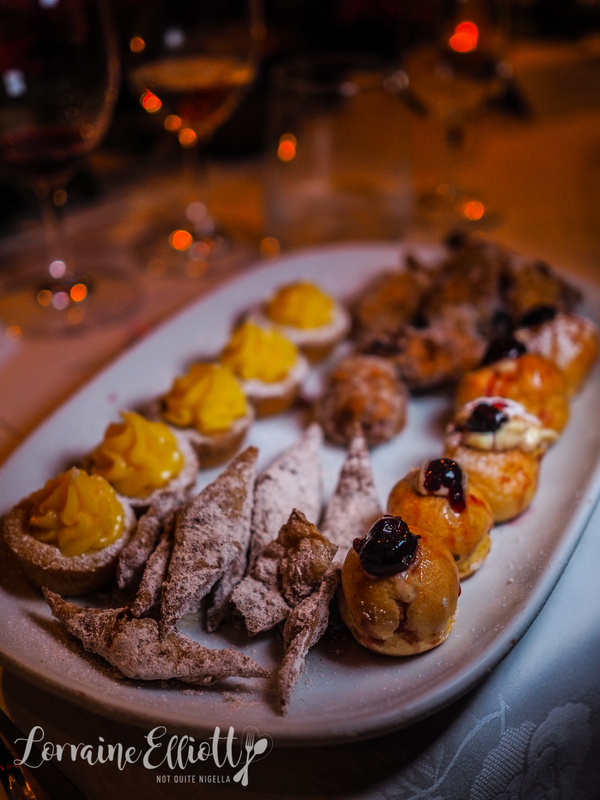 A bountiful tray of plump petit fours appears and we pick one of each, because denying oneself of these perfect bites of heaven would be a travesty. One speech kicks off the next and Rake TV series creator Peter Duncan remembers one incident, "Armando said that he doesn't do take away when Tom Cruise wanted him to cater for his flight back home. My former partner who is fine was going through chemotherapy at the time and I rang and spoke to Gemma and Armando as she wanted to have "the pasta" and there was not a hint of doubt about this takeaway. This was takeaway given with kindness and love and plates and cutlery as if we were living in a hostel and I will never forget it. It was one of the kindest and most sensitive gestures I've ever experienced. That was an act from the heart." 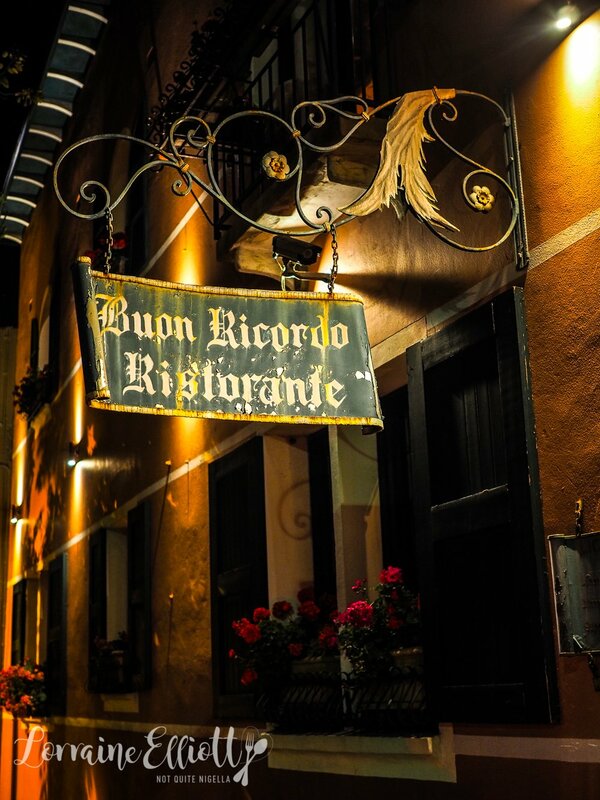 So tell me Dear Reader, have you ever dined at Buon Ricordo? 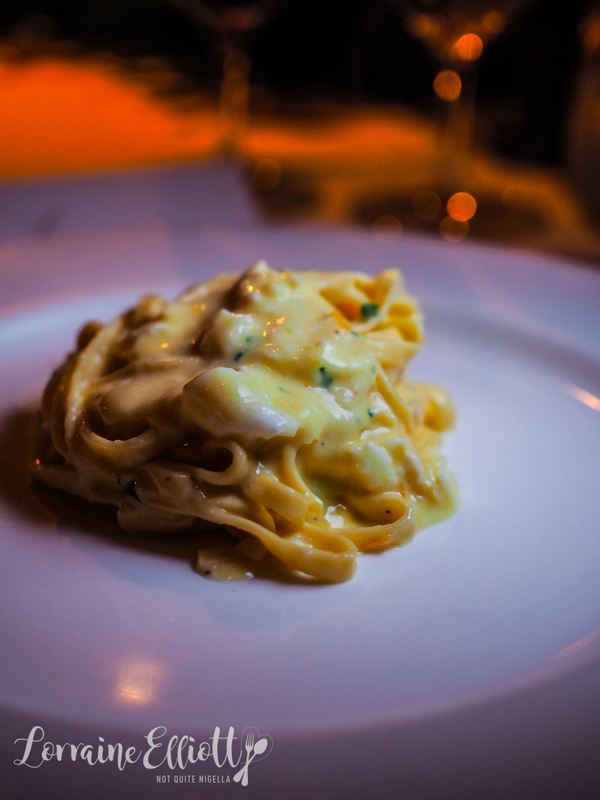 Have you tried the truffle egg fettucine? NQN and Mr NQN were guests of Buon Ricordo but all opinions remain her own.